The Secrets Of Wealth Creation Revealed posted on Wealth Creators Club Forum. (names and email addresses supplied - refer to Forum) . "Fantastic, Inspiring - Thanks Mr. Goodwin"
"This book is the best investment I've made for myself and my family. I'm totally inspired after reading this book"
"I believe that anyone who is fortunate enough to read it (The Secrets Of Wealth Creation Revealed) will definitely change the way they view wealth and how easy it really is to attain it once you understand the principles involved." "What an incredible read. Mr. Goodwin certainly has come out with an excellent book." "The Secrets of Wealth Creation Revealed" has opened my mind and launched me on a simple yet incredible journey toward wealth creation. Thank you again for sharing this knowledge"
"It's the kind of book that you will read again and again, it's a reference guide to wealth creation and a blue print for success." "it's up there with books in the caliber of Napoleon Hill's "Think & Grow Rich", one of the most influential books of all time in pointing the way to financial independence." "If you really are serious about improving your lot in life, and want to master the secret of true and great wealth, then you owe it to yourself to purchase Charles Goodwin's distilled wisdom on this subject." "Be prepared - for when you put his philosophy and plan to work in your own life you will begin to see the accumulation of riches in great abundance and quicker than you ever dreamed possible!" "Fantastic, Inspiring - Thanks Mr Goodwin"
"What an incredible read. Mr Goodwin certainly has come out with an excellent book." "Mr. Goodwin. I congratulate you, your inspired knowledge on wealth creation is true enlightenment Totally awesome!" "What Charles Goodwin says about wealth creation makes complete sense and I can see exactly where I've gone wrong before. I urge everyone to grab a copy while they can. It explains exactly how to get of the rut and on the right track." 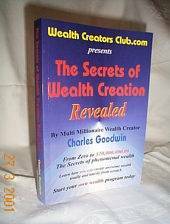 "I would like to thank and congratulate Charles Goodwin on his excellent book "The Secrets of Wealth Creation Revealed"
"I'm well into my wealth program and have never looked back since reading Charles Goodwin's book. I would never had thought that one book could have such an effect on me. Personally I think the book should be in every library, so that every one, if they so choose, can access it." "I would never had thought that one book could have such an effect on me!"